A few weeks ago the economics blogs and popular press picked up a forthcoming JPE paper on child sponsorship by Bruce Wydick (also in the economics department here at USF), Paul Glewwe, and Laine Rutledge. The paper uses a clever identification strategy involving age-eligibility rules and sibling order to isolate the effect of charity child sponsorship on adult outcomes, and finds extraordinarily large positive effects on everything ranging from educational attainment to income to civil engagement. You can find an ungated version of the paper here. Empirical psychologists describe a kind of data-quality pyramid in behavioral research: Subject behavioral responses to hypothetical scenarios lie at the bottom of the pyramid. Ranked barely higher are answers to direct questions (e.g. do you consider yourself a hopeful person?). These approaches are dominated by reported (actual) behaviors, and even more so by behaviors that are observed by the researcher in non-experimental and experimental settings, which lie at the apex of the pyramid with fancier techniques such as directly analyzing brain-scan activity. 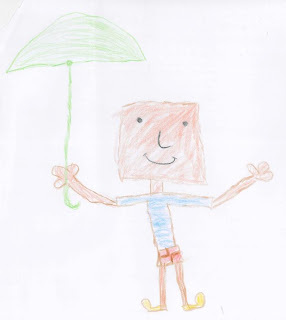 In a lengthy empirical literature, child psychologists have found that certain facets of children’s self-portraits to be empirically correlated with aspects of psychological disorder and health. For example, monster figures or self-portraits with big, sharp teeth have been (not too surprisingly) correlated with aggression. Tiny-figure self-portraits and missing facial features are correlated with low self-esteem. Choosing dark colors over light ones is correlated with hopelessness and depression. On the positive side, light colors are empirically correlated with optimism, standing under an umbrella with self-efficacy. You can read more about the follow up paper, including more details about the methodology involved, in Bruce's post at the World Bank's Development Impact blog.